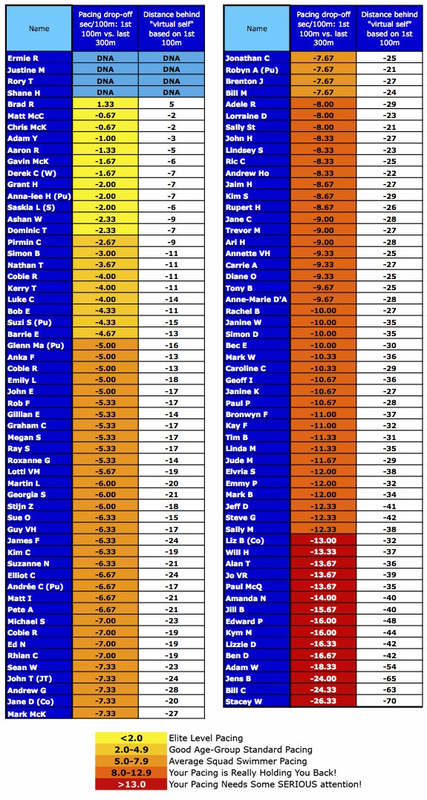 How Did The Swimmers Who Made The Biggest Improvements In 2013 Do It? As we build up to the New Year, now is the perfect time to look back on the last 12 months, have a reflect on everything that happened, good and bad, make some plans and set some goals for 2014. Swim Smooth Coach Emma Brunning recently made her second trip out from the UK to Perth after a gap of around 6 months and has some really interesting reflections on how different athletes improved within the Swim Smooth Squads whilst she was away and how they did it. Wherever you are at right now with your swimming, hopefully it will kick start a few thoughts and ideas in your own mind about how you can take things to the next level in 2014. I am one of the UK Certified Coaches lucky enough to run my own business Active Blu on Lake Windermere in the beautiful surrounds of the Lake District National Park. This year and last I've had the opportunity to escape the dark and wet British winter for a few months to visit Australia, and as you can imagine I grasped it with both hands! 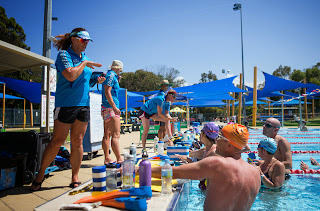 Perth is a fantastic place to visit and the work is really interesting too, I have been coaching in the extensive Swim Smooth squads and supporting our Coach Development Programme working with the latest group of certified coaches in training. Lane 1: My favourite lane to work with! I'm typing this on the flight back from Australia right now and thinking back to everything I saw over the last 3 months in Perth. It was really evident just how many of the squad had improved since last winter, not just in performance but also in confidence. As a passionate coach that likes to see people achieving their goals and dreams, I wanted to share my reflections with you to help make your training more enjoyable, useful and rewarding. 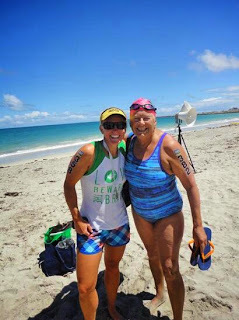 - the oldest woman to have swum the English Channel! - Be realistic with your time commitments, it is far better to train slightly within yourself but very consistently than go through a boom-and-bust cycle of training as you overcommit and life bites you back. - Whatever your level of swimming and level of commitment, recognise at the end of the day it’s about enjoyment so make sure that you enjoy the routine you create and that you don't put too much pressure on yourself. If you're a 'highly strung' person then often less pressure brings better results. 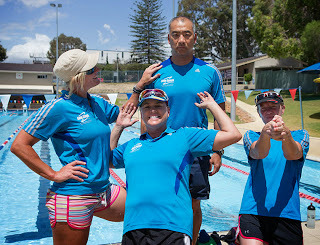 - It is a lot of fun (and great motivation) to train in a well organised squad and the group dynamic can really push your swimming forwards. These days squads often cater for all levels of ability and if at all possible I'd recommend you try a few sessions with a local group to see how you get on. The group camaraderie in the squads in Perth is incredible and whilst us certified coaches can't bring the Perth sunshine to your area, we do actively nurture that same positive, motivating and athlete centred approach in all our own local squads. Being part of a group like that can make an incredible difference to your swimming, don't miss any opportunity you have to join one! It's not all hard work on the pool-deck. - Follow the same structure every week, for example: Monday- CSS training set. Wed – Technique session. Friday – Endurance session. Keep a routine like that rolling for months on end and you can't help but improve. - Be really clear in your mind what the goal of each session is and how it will help you improve. - Work out your CSS and monitor your progress to gain motivation as you improve. You would be amazed how often swimmers take big strides forwards but don't realise it and struggle with motivation or even quit just when it is coming together! 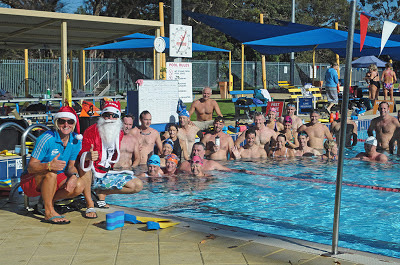 In Perth we normally conduct some sort of timetrial or a CSS test every 8 weeks so every swimmer can see how they are progressing, you should do the same. - Keep a training log so you can track your consistency over time. - Recognise that you can only move your fitness forwards slightly from each individual session but from a series of 20, 30, 50 or 100 sessions over many months (and even years) you can really move mountains. So see the goal as completing a block of training rather than attempting world-records in a single session. - If you're training hard then schedule recovery and lower intensity weeks to avoid burn-out. - Your training needs to include your race skills. If you are a triathlete or open water swimmer that means practising open water specifics such as drafting, sighting and developing a symmetrical stroke to swim straight. You can put a huge amount of effort into improving your basic stroke technique and fitness but it will all go to waste if you can't execute well in your race environment. - Practice what you least like as these are probably the areas that need most work! - Do not underestimate the importance of breathing drills, no matter what level you are at with your swimming. OK, I hope that triggers some thoughts to reflect on with your own swimming and how you might go about improving things for yourself in 2014. Think of some new challenges and know that with the right support, training and advice almost anything is possible! Best wishes and have a fantastic New Year! Wishing You A Very Smooth Christmas! No proper blog post this week as the Swim Smooth team are taking a few days off in the build up to Christmas, spending some quality time in the Christmas queues and busily wrapping presents for loved-ones! Merry Christmas from the squads in Perth! We have been particularly busy recently working on several big projects behind the scenes which will see the light of day next year. 2014 is going to be a very exciting year and we can't wait to show you what we have in store for you and how it will improve your swimming or coaching - you're going to love it! That just leaves us to thank you! Swim Smooth is all about helping swimmers get faster and enjoy their swimming more, and you guys are a huge source of inspiration to us. Thanks for sending in your thousands of stories, experiences, news, views, questions and suggestions over the course of the year. Please keep them coming in 2014, we love to hear from you from comments on the blog itself, facebook, twitter (here and here) and of course even by good old email. Have a super-smooth Christmas and a swinging new year! Last week's blog post But I Was Just Chasing Ray! was about how most of the swimmers in our squad started their 200m and 400m time-trials much too quickly and under performed as a result. Thanks for all your comments and feedback about it - great to know it was well received! Carl in Minnesota wrote: I inevitably see the very drop off that you talk about in today's post when I swim. I can even notice it in the 50 m splits... My first 50 can be as fast as 0:38 if I am really pushing it, but more typically it is around 0:42. My second 50 is typically 0:46, and then I settle into my pace of 0:49-0:50 per 50 m. If I try to ease back on my first 100 m pacing, it actually SLOWS my 400+ m times! I still end up swimming all the rest of my 50's at the 0:49-0:50 pace. Hi Carl, this is a classic situation to find yourself in, the first thing is (and we hope this doesn't sound rude!) but we actually don't believe you will be slower if you pace things out evenly. When you start at 38-42 seconds per 50m it feels very doable but the truth is that you're entering 'the red zone' and the damage is being done for the rest of the swim. It takes a minute or so for your breathing, heart rate and muscular feedback to respond but by then it is too late and you slow down dramatically - and in a maximum effort like a timetrial this is going to hurt a lot! From our experience if you actually started at 46 seconds for the first 50m you will be able to sustain that pace for the rest of your swim and end up quicker overall. We see swimmers make this improvement all the time, the hardest part is to actually get them to slow down over the first 50-100m. Once they've got that first lap or two right, they naturally swim quicker without even realising it (and it normally feels easier too). But of course this isn't just about sustaining a level of work, it's also about sustaining your stroke technique. If you start too fast and then fade, your stroke will deteriorate (perhaps feeling like it is 'falling apart') and you will slow down yet further. If you have any sort of crossover, scissor kick or poor body position this will inevitably worsen and you'll really start to fight things. The drop off in output plus the deterioration in technique means you slow down hugely - a real double whammy. Should I really be trying to force myself to slow down my first 100 (and thereby slow my 400 and 200 m times) so that I force myself to pace my swims better? Absolutely yes! Although we doubt you'll actually be slower over the 200m and 400m - perception and reality can be very distorted with poor pacing, which is obviously the root of the problem in the first place. An analogy we like to use is to imagine transitioning from being a high revving petrol engine which is great for sprinting to becoming a diesel engine which can sustain more continuous power for long periods of time. Go diesel and your distance swimming will come on leaps and bounds! Oliver K said: First of all I must say that I never ever go for 400m as fast as I can. I mostly swim 50m and some 100m, and then 400m is close to infinity. So I go "strong"; I feel that has a kind of "fixed" meaning, but at the end of 400m I feel puuuh, rest say 60s in the water, and continue, while with a race I would either die or crawl out of the water with the last remaining strength (and die then). That's that high revving petrol engine at work Oliver! Can you see the trap you are in here? By never swimming further than 50 or 100m you never train your diesel engine so it never develops. The only way out of this is to swallow some pride and sustain some longer swims at a slower pace. No it won't feel good at first but your fitness will start to improve and it will progressively feel easier (and faster) to do so. It is this aerobic fitness you need - it's not your strength that's failing you. Get this right and you'll find 400m is only a short warmup - not infinity at all! Isabel in Quebec posted: I have been pondering Carl's exact same question for a long while too. My first 50m is a good 5-6 seconds faster than my average speed (49' first 50m, average 54-56'). I figure at least half of those 5-6 seconds is the time it takes to turn around (I don't tumble) and if I'm already going as fast as I can, I can not do as well on the other laps because i don't have those free seconds I get from the inital push off. I'm thinking maybe I can do a crescendo, start off slow and catch up on the last 100m, but I think that at the very best, I finish off with the same total time and I will only have worked harder the last 100m. Hi Isabel, this is obviously along a very similar vein to Carl and Oliver's questions and you can see our answers there (and we don't think it's the push-off, you get one of those on every length?). Make sure you time yourself push-off to push-off, not push-off to touch before you turn. That way you will be measuring the exact same thing on every length. To us the key points in your post are in the very first and very last sentences. You've been pondering this 'for a long while' which suggests to us that you've been starting fast and then slowing down in pretty much every swim you do over many months and perhaps years? The question you've got to ask yourself is this: has that been working for you? Are you swimming as quickly as your hard work deserves? We're guessing not. At the very end of the post you say 'my mind doesn't get it' and that - right there - is the trap isn't it? You simply have to come to terms with the fact you need consistent well paced longer swims in order to improve. 8x 300m with 20 seconds rest between each 300m. 1) You can swim this at any speed you like but every lap must be the same speed - don't start too fast no matter how easy it feels over the first 50-100m! Ideally use a beeper to get this spot on. 2) The whole session has to be straight swimming with no toys at all (e.g. pull buoy, paddles, fins) except for a beeper. Swim 3 to 4 sessions every week and include that session as one of them. After four weeks you will start to notice the improvement in the speed you can sustain over 200m and up. What's more, that improvement will continue for a long time as you keep that consistent training and pacing rolling week-in week-out. It's Not Easy Being An Arnie! Most Arnies reading this won't truly come to terms with this and will disregard it, leaving them in the poor pacing trap until they do. If you can be the one to truly take it on board and swallow the bitter pill of swimming slower but more continuously, you will soon be on the way to being a much faster swimmer. "But I Was Just Chasing Ray!" Last week with the Swim Smooth Squad in Perth, we conducted a 200m and a 400m timetrial to calculate each swimmer's threshold (or CSS) pace. This threshold pace is the speed they should be able to sustain over 1500m in a race. We were lucky enough to have eight coaches on the pool deck so that all 112 swimmers who swam the test (over three sessions) got their times individually recorded. Not only that but during both the 200m and 400m swims, we recorded their first 100m split to compare the speed they started versus their overall time to assess how well they paced things out. All the timetrials were from a push (not a dive). Even if you're not a numbers person bear with us here, there's some really useful things we can learn from the results. To keep things simple, let's look at their 400m timetrials and compare the speed they swam the first 100m with the speed they swam the last 300m (in the left hand columns below). Remember the idea of a timetrial is to swim the overall distance as fast as possible to get the best overall time. To help visualise what this means, we calculated how each swimmer would have swum if they had kept up the same speed after the first 100m and how many meters they ended up behind that 'virtual swimmer' in their real swim. That's the right hand columns above, showing most swimmers ended up around 20m behind their virtual selves and many 30 to 70m behind! If these swimmers had started off a few seconds slower over the first 100m, they would have sustained a much faster pace and swam much quicker overall as a result. For the guys in the red-zone above, they might have swum a whole minute quicker over the 400m by pacing things out better! It's important to appreciate that despite most of the squad swimming with poor pacing (to a greater or lesser extent) most improved their speed between 3 and 5% since July - imagine what they could achieve by pacing things out correctly. to start the timetrials with the 9:30am squad. Megan joined the squad less than 18 months ago and in her first video analysis session with us was swimming around 2:15/100m. 10 weeks ago Megan's CSS pace was down to 1:45/100m (a quantum leap!) and last week she tested at 1:41/100m - an improvement which would save her over 1 minute per mile. But is Megan in the 20% who paced things brilliantly last week? Actually no! She went through the first 100m in 1:32 but fell away to 1:37/100m for the last 300m. When we pointed this out to Megan she replied "But I was just chasing Ray!". Could this same competitive drive also be costing you during your races and training sets? Cobie is one of the most consistent swimmers in the squad and as a result she's improving at a huge rate of knots. Out of choice (!) Cobie swam in all three of the squad sessions where we performed the 200 and 400m timetrials and so she had three goes at it. Cobie's CSS worked out at 1:59.5 on Wednesday, 1:51.5 on Thursday and 1:53.5 on Friday - all a huge improvement on her CSS in July of 2:11.5. What can we take from this though? Well Cobie's best performance came on Thursday night when coach Sally suggested that she should "treat it like a training session" given that she'd already done the test 36hrs previously. The result? Much less stress, better pacing, and a significantly faster result! Sometimes we build these things up into something they're not - a timetrial is only ever a gauge of where you're at, right here, right now - nothing more, nothing less. Don't fear them, embrace them for the value and insight they offer. Obviously he gains a couple of seconds from the dive at the start and is able to lift his effort to sprint the last 100m but his judgement for the rest of the swim is incredible, with every 50m within a range of 0.7 seconds. Amazing pacing skills! Do you think you could do that? How about with the adrenaline of an Olympic final in your system? These figures actually give us an insight into how Sun got himself into such supreme shape for that swim - you can imagine how precise he was through all of his hard sets in training. Not only does poor pacing harm your race performances but it also harms your training as you fade during training sessions. By learning to pace things out correctly you will improve the quality of your training and get bigger fitness improvements as a result. You still want to train hard but aim to sustain a strong effort through your sessions instead of starting too fast and fading away (or blowing up!) every session. For more information on how this should feel, see our เกมยิงปลา HappyFishingGradual Crescendo blog post. 80% Of You Do The Same? Looking at the figures from the squad, over 80% paced things quite poorly. We can easily extend that to the readership of this blog and say with 80% confidence your own pacing is pretty poor too and needs some work. Fix this by pacing out your swim well (like Sun Yang) and you'll almost certainly set some personal best times straight away. Even better, those PBs will keep on coming over the following weeks and months as you get the fitness improvements from the improved quality of your training. One of the best ways you can develop your pacing skills is with a Finis Tempo Trainer Pro - a brilliant gadget that will beep a pace to you as you swim. Set it to the speed you want to swim and simply pace yourself so you turn and push-off the end of the pool when the beeper goes and you too will have perfect pacing. "I managed a PB for the 400 so I'm stoked. I thought I would do around 7:00 and managed 6:51 so I'm thrilled. I always worry about blowing up after the first 100 and knew I'd done the first 100 fast so I backed off consciously in the 2nd, much as I wanted to keep up with Shane (who smashed it!). Then I felt like I built up my pace into the 3rd and 4th 100s." เกมยิงปลา HappyFishingWishing You A Very Smooth Christmas!